Over the past fifty-five years, Rizzoli Bookstore has become a New York City tradition, not only as a purveyor of fine books, but also as a center for culture and discussion. Since relocating to 1133 Broadway almost four years ago, Rizzoli has consistently enriched the NoMad neighborhood with its schedule of talks, book signings and musical events. In case Kew tenants were not aware, Rizzoli currently hosts two varieties of ongoing events, which it publicizes on the events page of the Rizzoli website and via the store’s email list. As new books are released, Rizzoli is a favorite stop for authors. They stop by for book signings to do readings, or discuss their latest releases. These events occur four to five times per week, usually in the evenings after work. Among the celebrities that have visited Rizzoli are Manolo Blahnik, Diane von Furstenberg, Steven Holl, Tim Gunn, Michael Bierut, Hilary Knight, Bernadette Peters, and Ruth Reichl to name only a few. Discussion topics range from interior design to cooking to authors’ memoirs. The subject range is as wide as the encyclopedic selection of books Rizzoli has for sale. Occasionally, an RSVP is requested to hold space. 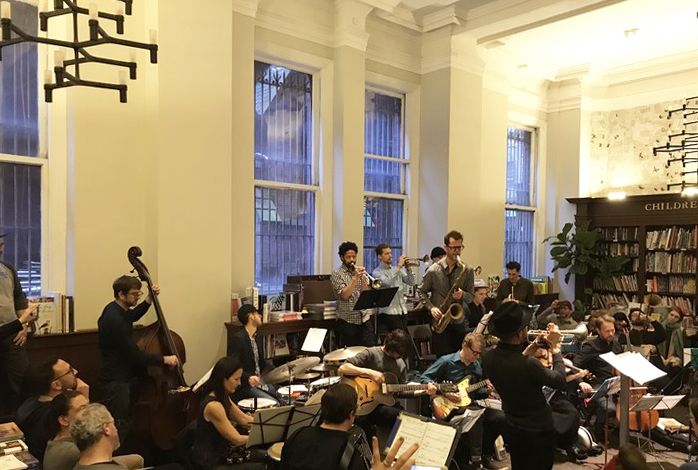 In addition to regular book signings and talks, Rizzoli’s Music Aperitivo series hosts a variety of international jazz artists performing in Rizzoli’s intimate salon. Held one or two Sunday evenings per month, the Music Aperitivo series is offered in partnership with Mondo Jazz and Mionetto Prosecco. It’s a great way to spend a relaxing Sunday evening in NoMad. RSVPs are requested for these events. Tickets are $20 at the door, and admission includes a complimentary glass of prosecco. To receive word on the latest upcoming music and book discussion events, Rizzoli invites Kew tenants to sign up for its email list via the Rizzoli website. Don’t miss the opportunities for enrichment and enjoyment available right here at 1133 Broadway.